The Rise, Fall And Redemption Of New Orleans' 'R&B Emperor' In a life of wild ups and downs, Ernie K-Doe pierced the national consciousness in 1961 with the song "Mother-in-Law." Ernie K-Doe and his fans at the Warehouse in New Orleans in 1974. Even in a city known for its eccentrics, Ernie K-Doe was in another dimension. The New Orleans musician always knew — and said, loudly — that he was special. And for one week in a life of wild ups and downs, he managed to pierce the national consciousness with a chart-topping hit: 1961's "Mother in Law." The man born Ernest Kador sometimes claimed he wrote "Mother-in-Law" — but he claimed a lot of things. In fact, Allen Toussaint composed and produced the song, and, after a few unsatisfactory takes, literally threw it away. It was rescued from oblivion by one of the backup singers at the session. "He thought it was just a delightful song, and he took it out of the trash can when I took a short break, and went over to K-Doe and said, 'Look, try this again, man,'" Toussaint says. "K-Doe did just that, and I'm so glad he did." The song was dismissed as a danceable novelty. But Ben Sandmel, author of the new biography Ernie K-Doe: The R&B Emperor of New Orleans, says it was deeper than that: angry, and smoldering. "In 1961, to say that your mother-in-law was 'sent from down below' was kind of pushing the standards, I guess, of what was considered to be acceptable," Sandmel says. "In a time of meaningless bubblegum lyrics, this one had an edge to it. And it was real." It was one of four songs that Toussaint and K-Doe recorded in one three-hour session. "We certainly had a good time together. I wrote so much for him, and I was highly inspired," Toussaint says. "He was [good at] promoting himself. He would get out there; he wouldn't watch the grass grow." When Toussaint went into the army, K-Doe continued recording, without much success. The two got back together in the early 1970s, but none of the songs they produced became hits outside of New Orleans. Within their hometown, however, many of their tunes have become standards. Guitarist Ernie Vincent, who has played them in his own band and others, got to know K-Doe in the '70s. "He was strictly positive about his self-ability," Vincent says. "He always said, 'I'm cocky, but I'm good.' And believe me, he was good." But he also had some tough times. The British invasion's version of R&B became more popular than homegrown music, and by the mid-'70s, K-Doe had pretty much dropped out. He drank a lot, and many people remember seeing the once-dapper musician living on the streets. K-Doe made a comeback in the 1980s on the New Orleans station WWOZ. David Freedman is now the station's general manager. 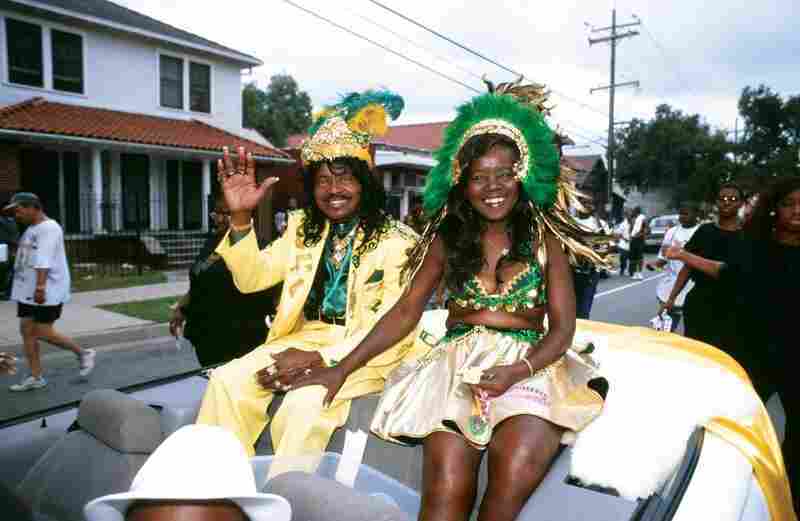 Ernie and Antoinette K-Doe in a Treme neighborhood parade in 2000. "You never knew what the next thing was going to be out of this guy's mouth. It was like he was in a trance state," Freedman says. "You had to kind of enter into it, and then as you began to enter into that crazy universe, you'd just kind of surrender to it [and] it all made sense." K-Doe's run on the radio ended in the late '80s, though cassette tapes of his shows continued to be collected and played around the world. In the early 1990s, his life took another turn when an old friend, Antoinette Dorsey Fox, took him in. They got married, and she created a new look for her husband, replete with capes, shiny suits and feathered hats. And she created the Mother-in-Law Lounge, where K-Doe would perform once again. 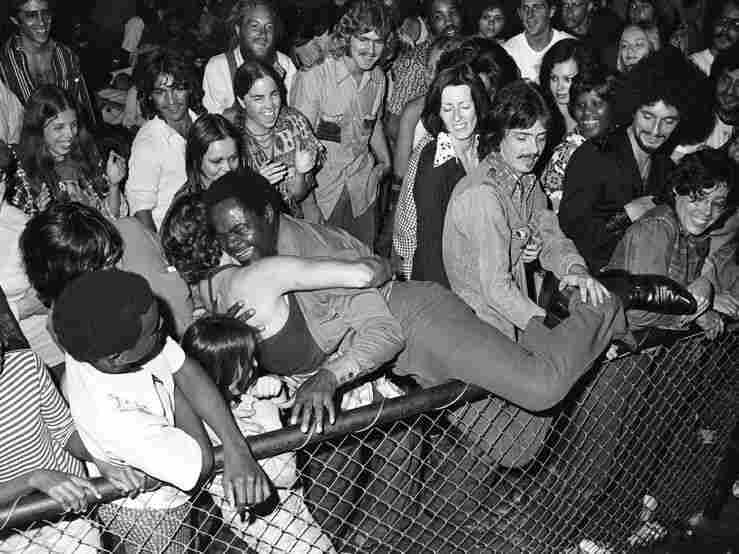 "I forget how many people it holds, but it used to be wall-to-wall — it was packed," says Eva Perry, who sang backup for K-Doe during that era. "He had people coming from everywhere to hear him, since he was back his second time around." Ernie K-Doe died in 2001 at the age of 65, but he didn't exactly leave: His wife commissioned a likeness, fashioned from a department-store mannequin, that she installed in the lounge. "Everybody wanted to take a picture with Ernie — you know, his mannequin," Perry says. "We all took pictures with him." The Mother-in-Law Lounge still stands, and there are rumors it will reopen — but without the statue. This piece's original headline ("Ernie K-Doe: A One-Hit Weirdo's Rise, Fall And Redemption") has been modified to more accurately reflect K-Doe's legacy and career.